Weed control is crucial to establishment of trees in our area. Spraying is a necessary evil for most of us. (Organic methods using mulch- old carpet etc) are just great for 10-100 trees. Move up to thousands and and herbicides make the difference between a forest established and growing well or dead seedlings and an empty cheque book). Without weed control in our very dry and shallow soils- trees die. A large sprayed ring around a tree makes the difference between life and death for most trees. Wondering what large is? At least a 2 m diameter circle. However, spray type, rate and conditions all affect success. This page will document some of our experiences. Photos below show trees in our district- mid-winter- June 22nd. Spray release was 1 litre roundup with 15 g of Granstar per 120 litres of water. The Granstar went on at too high a rate. Oops. 5 g would have been a more appropriate rate. 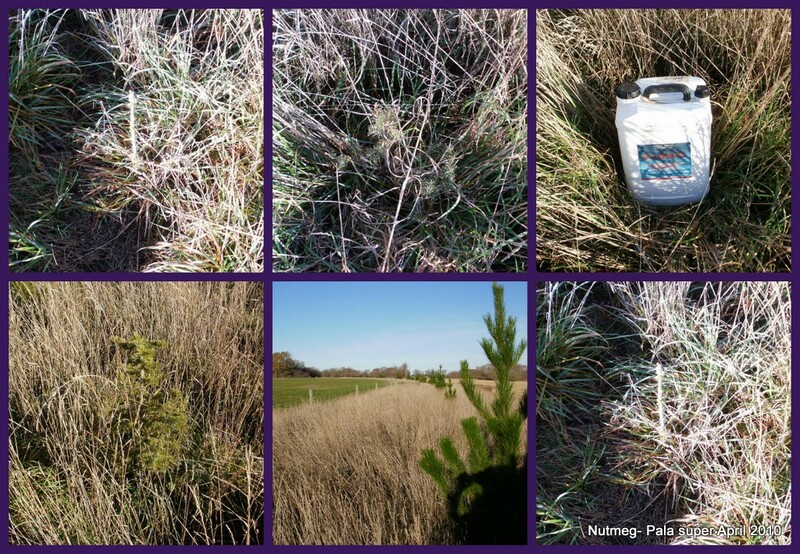 We also sprayed – on same day- Haggersten Grey and Deodars- pre-plant and spray release- using the same mix. July 26 and 27th – pine and poplar release sprayed and poplars near cattle yards- spray release 1 litre roundup with 5 g of granstar and 50-60 ml of surfactant in 100 litres of water. At Rockless- planted infill pines. 1 Control, then 2 – grow tab then boron + cropmaster 15 100g about 30 cm from trunk. All well sprayed earlier- see above for the rates used deodars were planted also. Trees on outside edge of Dufus- planted with Himalayan Cypress (Cupressus torulosa). towards bottom end, we set up a small trial with the new trees – control, no twine, one grow tab- blue twine and a teaspoon of boron and about 100 g of Growmaster 15 fertiliser from Ravensdown dug into a slot at least 30 cm from the tree received an orange twine. About 15 trees in that trial. 24 August with MD- sprayed at bottom of our block, first row of willows/poplars below the ‘old pines’. End nearest river got 400 ml of 360 g ai/ ? in a 20 litre knapsack with dynamo at about 25 ml. The end nearest Jakes Road got 200 ml of same mix, with same amount of dynamo (approx). Using a TK3 and a TK 2.5 mm nozzle. Sprayed below this and pre-plant sprayed grass for other trees- maybe nitens to go in.